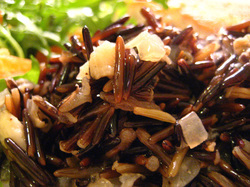 Wash 1 cup uncooked wild rice thoroughly. Add to 3 cups boiling water in a heavy saucepan. Return water to boil and stir. Reduce heat and simmer, covered, 50-60 minutes or just until kernals puff open. Uncover and fluff with table fork. Simmer five additional minutes. Drain any excess liquid. For chewier texture cook less time. Yield: 3-4 cups of cooked wild rice. Cut squash in half and roast in the oven on a sheet pan. When squash is cool, cube. Make a dressing in the blender with cranberries, vinegar, oil and thyme, Dress the rice and squash, stir and serve.